Candace joined in the CosRunning fun at the 2015 Wine & Dine Half Marathon along with Jake who shared his own scary Monsters, Inc. costuming ideas. CHARACTER: Boo and Mike Wazowski from Monsters, Inc.
A great big thanks to Jake for not only starting this whole CosRunning series, but for graciously allowing me to join in the costuming fun to share some of my own Disney-inspired race costume ideas and concepts! 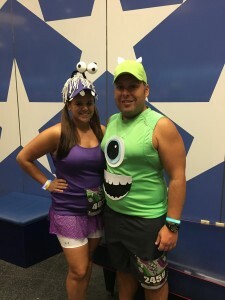 We decided to do a group costume idea for the 2015 runDisney Wine and Dine Half Marathon, and came to the conclusion we would do Monsters, Inc. since there was such a wide variety of characters. I knew instantly I wanted to dress up as Boo and I was able to (with some persuasion) talk Mike into dressing up as Mike Wazowski. Once he caved, Mike’s only real requirement of making his costume is that it basically had to be all running clothes. Seeing as Mike (Wazowski that is) is a green one eyed monster, I figured most of his costume could be made from the shirt. 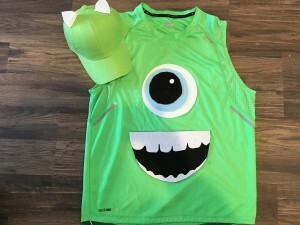 So I had Mike (the Casual Runner, not the monster) find a green tank top that he wanted to run in. I then searched online for a matching green ball cap. His choice of bottoms was at his discretion. For Boo I wanted to go the route of when they dress her up as a monster (as opposed to “just” her as a little girl), so I knew that most of my outfit had to be purple. Luckily I had worn a purple skirt from a previous race that I could reuse. I also decided to go with white running shorts under it, seeing as she wears white under her monster costume. 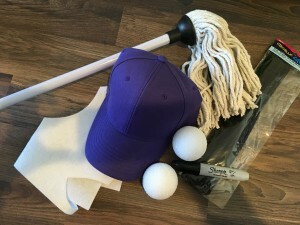 The only part of my costume that I had to order was a purple tank top and hat. The hat is where most of my design and work were going to happen. For the Mike Wazowksi costume I decided I was going to hot glue a large eyeball on the shirt. For this I purchased light blue, black & white felt. To get the perfect size circles for the eyeballs, I traced around my kitchen canisters that were three different sizes. I freehanded the mouth out of black felt for the base and white for the teeth. I also had to cut out two white horns for the hat. The next step was assembly. I glued down the white circle, a smaller light blue circle followed by an even smaller black circle then completed it with the tiniest white circle. Next I glued down the outline of the mouth directly to the shirt followed by gluing the teeth to the background. Side note: I decided to overdo it on the hot glue because I did not want any of this to fall apart on Mike while he was running. I then attached the two white horns to the hat. With that, the Mike Wazwoski! costume was born. The only real construction work for Boo was her hat. 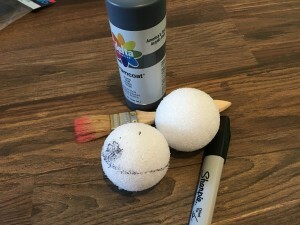 For this I needed a mop (a cheap one from the dollar store), two Styrofoam balls, black pipe cleaners, white felt & a sharpie. First I tried to turn my Styrofoam balls into eyeballs by drawing on them with a sharpie, but this did not work well at all. I made the decision at this point that painting the eyeballs would be easier, so there was some dry time involved. 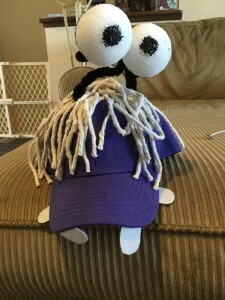 Next I cut the mop up into individual strands and began gluing them to the top of the hat to get the hair look going on. I then cut out four teeth out of the white felt and glued it to the underside of the bill. Once the eyeballs had dried I hot glued the black pipe cleaners to the Styrofoam balls then the pipe cleaners into the mass of mop hair I had going on. The rest of the costume would come together with my race clothes. This hat turned out pretty awesome if I do say so myself. It was a very hot night to run a half (which many know by now turned into a half-half). We were both very glad that we went with the route of tank tops and shorts. The hats also helped with some of the sweat running from our hair. I had originally started with my hair in pigtails but about a mile in I had to put it up in a bun off of my shoulders. Everyone was able to recognize who we were. We even had random people come up to us to ask for pictures with our group. Mike absolutely loved that everyone was yelling his name on the course (ya, that’s what happens when you dress as a character with your name). Overall it was a great time and we have great pictures to remember the night. He looks happy enough that I can convince him to run in costumes every time, right? Candace joined in the CosRunning fun at the 2015 Wine & Dine Half Marathon along with Jake who shared his own scary Monsters, Inc. costuming ideas. Don’t forget to Check out the other installments of Jake’s CosRunning Series. You can read his first feature on CosRunning & his second feature, where he showed you how he brought the characters from the Cars franchise to life. He got a little more daring in Part 3 as he channeled his inner Disney Princess and transformed into the Little Mermaid. His next installment brought you to Neverland as he created Peter Pan’s Shadow. In part 5 Jake returned to Neverland to join the Lost Boys. Part 6 got a little darker as Jake showed you how to run a Galactic Empire with Star Wars inspired running costumes. You can also check out our picture gallery of race costumes on our Facebook page. If you are looking for ways to add more character to your Casual Running adventures, consider running races in Costumes. 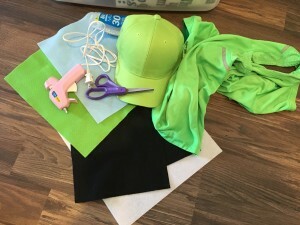 Jake will be bringing you more great features with costuming ideas – including how he creates his great looks – that are both awesome looking and runner friendly.